Upon arrival at Delhi Airport, a representative of Rover Holidays will meet and greet you and then transfer you to the pre-booked hotel. Freshen up and relax. Spend remaining time at leisure. Dinner and overnight stay will be at hotel. Check from the hotel after having breakfast. Proceed for full day guide city tour of Delhi, the national capital of India. Explore several historical monuments and contemporary government buildings as well. Major attractions include Rajghat, Jama Masjid, Red Fort, Chandni Chowk, India Gate, Rashtrapati Bhawan, Sansad Bhawan, National Museum, Qutub Minar, Humayun’s Tomb, Akshardham Temple, Lotus Temple, and Old Fort. On time get back to the hotel for dinner and scheduled overnight stay. After a leisurely breakfast check out from the hotel in Delhi. Drive to Jaipur, the capital and largest city of Rajasthan, famously known as the Pink City of India. On arrival in Jaipur, check in at the pre-booked hotel. Spend rest of the day at leisure. Dinner and overnight stay will be at the hotel. Embark on full day Jaipur sightseeing tour after breakfast. Key attractions to see in the city include Amer Fort, Jaigarh Fort, Nahargarh Fort, Jal Mahal, Hawa Mahal, Rambagh Palace, City Palace, City Palace Museum, Govind Devji Temple, Birla Temple, Laxmi Narayan Temple, Albert Hall Museum, and Jantar Mantar Observatory. Explore local colorful bazaars in the evening. On time return to the hotel for dinner and overnight stay. Have hearty breakfast at the hotel and then drive to Agra (Uttar Pradesh), the city of Taj Mahal, en route visiting Mughal’s abandoned capital Fatehpur Sikri (Agra, UP), a UNESCO World Heritage Site. Buland Darwaza, Panch Mahal, Jodha Bai Palace, and Dargah are key attractions here. Continue to Agra. Check in at the hotel upon arrival in Agra. Visit the Taj Mahal at sunset. Dinner and overnight stay will be at the hotel. Make an early morning visit to the Taj Mahal, the Symbol of Love, at sunrise. Return to hotel for breakfast and then make visit the Agra Fort and some other attractions of the city. Taj Mahal and Agra Fort are UNESCO World Heritage Sites. On time drive back to Delhi en route visiting Akbar’s Tomb at Sikandra. 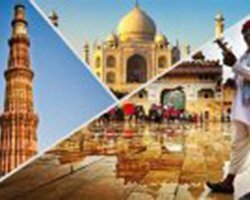 On arrival in Delhi, a representative will transfer you directly to the Delhi Airport where you board flight back to your onward destination with sweet memories of Delhi Jaipur Agra Tour in India.